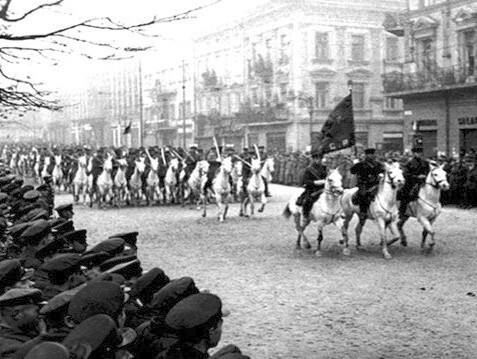 English: Soviet cavalry on parade in Lviv, after the city's surrender to the Red Army during 1939 Soviet invasion of Poland. The city, then known as Lwów, was annexed by the Soviet Union and today is part of Ukraine. Polski: Defilada kawalerii sowieckiej po kapitulacji Lwowa, Wały Hetmańskie obok Grand Hotelu.